A brief sunny spell in the garden. 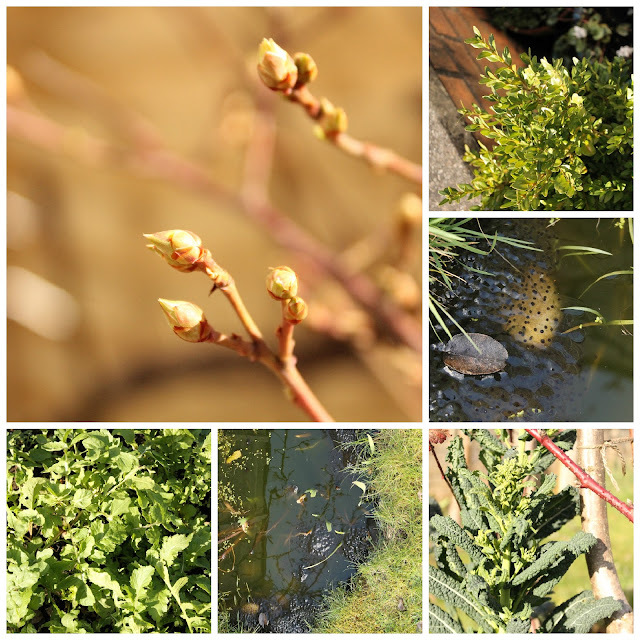 Blueberry buds, frogspawn and fresh rocket leaves. But not much else. I still haven't sown any seeds so far this year. Quite often I go too early and end up with windowsills full of little plants stretching towards the sun. I'm trying later dates this year, we'll see if they catch up. I am trying to settle into the deprivation that is Lent. No snacks except fruit, no salty deliciousnesses, no sugar. Sigh. It will take me a while. I am still in the bleak phase at the moment. I told the biggest boy my life was empty and meaningless on Day 1. I may have been overdramatising. (I don't really mean it, of course I don't, you know how I like to be ridiculous.) I shall of course get into the swing of it all and hopefully feel all the better for it. On the knitting front I have come to a halt with The Black Thing. The body is done, it just needs arms, but I'm just not feeling it right now. Apologies for the picture, it has a darkness about it which does not like to be photographed. It's like some sort of black hole sucking in all the light. I found some odd bits of yarn in much happier colours. Spring if you will. I'm thinking a small blankety thing for the living room in winter. For those days when a hot water bottle isn't enough, or for early mornings when the little people come downstairs to read and it's chilly. Alicia is making a lovely one here (scroll down to the last picture). I happened upon it as the yarn sat in front of me being considered. But I'm not sure if I can do a whole one in crochet. It's a funny thing isn't it, how most people favour either knitting or crochet. I'm more of a knitter. It's relaxing, up and down and back and forth. I find crochet a bit more of an effort, probably because I'm less used to it. But the texture, it's lovely. I'm torn. Thoughts? I'm also aware that crochet seems somehow to use more yarn. The weekend is upon us again. There will of course be football to be watched, come rain or shine (the weatherman says rain) and believe it or not the first cricket practice. That surely marks the start of spring. Have a good couple of days, I shall wish some sun for you. I like knitted blankets best. As for the weather, I'm really fed up with it at the moment. Hopefully, we will see some sunshine in the coming weeks. I don't blame you waiting before you start sowing seeds. I agree with you about knitting and crochet, crochet takes much more effort for me but then I do find it grows quicker. Have you looked to see if Lucy, attic24, can give you some inspiration? I do like the pale pastelly (is that a word?) colours. Nice springy pictures. I'm thankful that I don;'t give up anything for Lent. We have actually sown some seeds - it must be spring. We have sun here, so I'm sending some your way. I'm not much good at knitting or crochet, so not much help there I'm afraid, but I'm with you on the seed sowing. Am going to hold my nerve and wait! Hi. I saw Alicia's Beatrix Blnaket too... And wondere dif I should make one. You have a lovely stash of scraps there... It would be a great blanket. I think we are either knitters or crochters at heart. Kidn of like we are PC or Mac people... Maybe we can do both but if we have to choose we easily know which one we favor. And maybe that choice comes down to what we once learned first... It is just a thought. I'm not sure, but I would give the crochet blanket a thought... You have many moons ahead of you before autumn hits and you can go as slow as you wish. No pressure. when i partake, and i haven't at all for the last year or so, i prefer to knit. i've tried crochet on numerous occasions because it seems to me that you can do lots of interesting things with crochet -- and also, i have an aversion to dpns and circular needles so that really limits my options with knitting. but -- i never quite got to really enjoy crochet. which is quite typical of me, really. I'm on a crochet bent at the moment but I would say that knitting is my first love. Oh to be able to knit like you! I'm the opposite, crochet relaxes me, knitting makes me cross. Yes crochet uses more yarn but does lend itself very well to household items like blankets, whereas knitting definitely has the edge with clothes. Please persevere with your jumper because I think it looks really good. Also, I do like black. I'm about to knit a navy jumper, I suspect it will become a bit like your black beast. Your leftover yarn looks just like my leftover yarn. I just love Alicia's (and Beatrix's) colour aesthetic and have been meaning to tell her that I cross-stitched on 32-count linen a picture of Hunca Munca and her babies asleep in their wicker cradle for my three-year-old daughter who also wore the most beautiful hand-knitted cardigans throughout her childhood. The past was a different country and time stretched infinitely. Hunca Munca took me a couple of years to stitch whereas I whipped through Midsummer Sprigs (albeit on grey) in about a month. Working with black anything is tricky on the eyes I find. I've learnt to be more patient and so far I've sown a tray of broad beans and a few pots of sweet peas. Everything else will wait until the clocks go forward. Hoping it's not too wet in Glos. today for the football. I don't think you were being dramatic, I mean is life worth living without salty and sweet things? Hm..... I think not! I say go for the balnket, crochet is fast and fun. It depends on my mood whether I pick up my crochet or knitting these days. I find crocheting a blanket daunting and usually make baby or lap blankets but they are not much good for snuggling under with little people. I think you are wise to wait for some improvement in the weather before planting seeds. I admire your restraint in giving up your favorites for Lent. I'm a rare bird that can live without sweets but I do crave salt, even in a lone green olive! lol! Love that you can knit and crochet. I was thinking about learning to crochet by watching a tutorial (or two) on You Tube. if that doesn't work maybe I can ask around for some very patient woman in the area to give me some lessons. I have all these grandchildren sprouting up and I want them to have booties and hats and blankets that can be heirlooms. So glad to have found your blog, CJ! I love crochet more ever than knitting. And crochet blankets just ooze out hygge to me. I wouldn't even know how to go about knitting a whole one! The colors of those bits look lovely. I approve of the blanket, it'll be another knit to fall in and out of love as it takes time, regardless of the knitting or crochet method. It might be nice to bounce between the two projects for a while. Enjoy! The yarns in the last photo remind me of bird's eggs. If you are looking for a blanket that uses up bits and is knit --- check my Ravelry page for Love Is Love Is Love. It's based on The Coziest Memory, but is not scrappy and is in worsted weight.